Guru Gobind Singh Govt. College, Jandiala (Jalandhar) has recently given notification of 05 Guest Faculty (Political Science, History, Punjabi and Economics) and Data Entry Operator Vacancies. 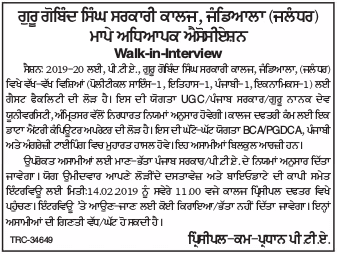 You can attend walk-in-interview for the Guru Gobind Singh Govt College Jandiala Recruitment 2019 on 14.02.2019. GGSGC Jandiala Recruitment 2019-20 latest notification is out. As per the Notification, there are 05 Guest Faculty (Political Science, History, Punjabi and Economics) and DEO. The educational qualification is as per the UGC/ Punjab Govt/ GNDU norms. The maximum age limit is as per the department norms. If you are looking for Jobs in Jandiala, Jalandhar then this article is going to be very helpful for you. Name of Department: Guru Gobind Singh Govt College, Jandiala. Date of Interview: 14 February 2019. Guest Faculty: The qualifications are as per the UGC/ Punjab Govt/ Guru Nanak Dev University, Amritsar norms. Data Entry Operator: BCA/ PGDCA, Punjabi and English typing. The maximum age limit is as per the college norms. You can attend walk-in-interview on 14.02.2019 at 11.00 AM in the Guru Gobind Singh Govt. College, Jandiala (Jalandhar) at the principal’s office. You can check the Guru Gobind Singh Govt College Jandiala Result or Interview List from the official website.